Nintendo released an image of a map in Super Mario Odyssey, and it seems that it looks quite peculiar. Let's take a look at the game's travel brochure map. Ahead of the release of Super Mario Odyssey for the Nintendo Switch, Nintendo JP teases us with an image of one of the super mario odyssey map of the game. The specific photo is a map of Tostarena, which is in the Sand Kingdom. However, the interesting part about this photo is the overall look of the map. 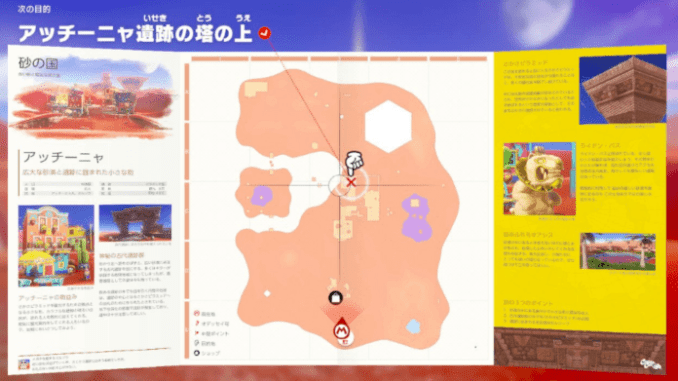 In the image provided by the Mario Odyssey JP Twitter Page, it seems that the map looks like a travel brochure. You know those pieces of paper that tourists guides give you for free to get a summarized look of the place you’re visiting? That is what the map looks like. Let’s take a look at the contents of the travel brochure map in the game. At the left side of the travel brochure map, it appears to indicate what kingdom you are in as well as some images of famous landmarks in the kingdom. On the right side, photos of famous landmarks is also shown. At the center of the brochure is the map of the entire area. An arrow icon with a M logo indicates where you are and a red X indicates the objective. There is also a black icon in the travel brochure map with a white shopping bag at the center. This icon could indicate the Crazy Cap shop. Since the theme of Super Mario Odyssey is all about travel and exploration, there is no doubt that Nintendo will push this theme and scatter it everywhere in the game, including the look of the map. In addition, Nintendo is also hosting a cross-country tour in the USA to promote the game. This tour emphasizes Odyssey’s theme of adventure, which could help gain some new fans for the series. Super Mario Odyssey releases on October 27, 2017 exclusively for the Nintendo Switch.